Police responded to reports of a shooting at approximately 7:15 PM on Monday, May 11, on the 6500 block of Sabado Tarde Road. The Santa Barbara County Sheriff’s Office reported that the shooting occurred during an altercation in front of an unspecified residence on the 6500 block. Two male residents, both University of California, Santa Barbara students, sustained gunshot wounds as a result of the incident. Though a handgun was found at the scene, it is currently unclear who fired the shots. Both wounded residents were transported to Goleta Valley Cottage Hospital for treatment and are expected to recover from their injuries, a transverse shot to the abdomen and a through-and-through shot to the upper left chest, respectively. Both suspects in the shooting have since been apprehended. Residents detained one suspect, 22-year-old James Joshua Taylor of Lompoc, Calif., immediately following the incident until the arrival of law enforcement, when he was transported to the hospital with the two injured residents to be treated for head wounds. The other suspect, 19-year-old Jose Guadalupe Gutierrez of Goleta, Calif., initially reported to have fled the scene in a white four-door sedan, turned up shortly at Cottage Hospital with injuries he claimed to have sustained in a vehicle accident on the UCSB campus. Police believed his injuries to be the result of the altercation on Sabado Tarde. Once they are discharged from the hospital, both suspects will be booked into the Santa Barbara County Jail. They have been charged with attempted murder, robbery, discharge of a firearm in the commission of a felony causing great bodily injury, and participation in a street criminal gang. Gutierrez has additionally been charged with possession of a stolen firearm. No definitive motive has been released for the altercation or shooting, though officials say the investigation is ongoing. 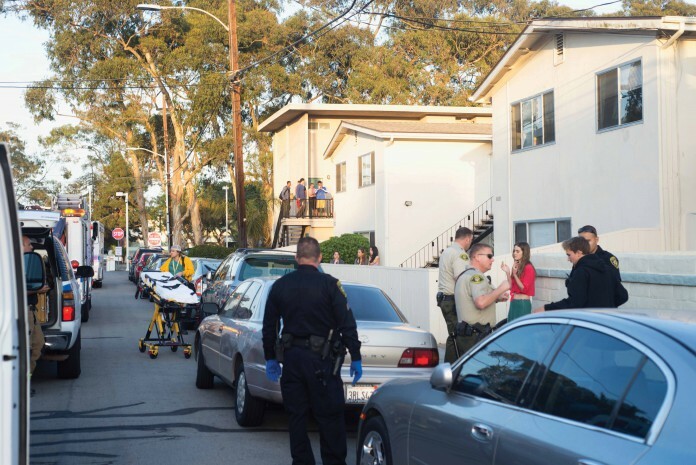 “Coming on the heels of the one-year anniversary, just the thought of anyone being injured out here in Isla Vista makes everyone’s heart sink,” said Sheriff’s Office Public Information Officer Kelly Hoover. UCSB residence halls were placed on lockdown and Isla Vista residents advised to stay indoors until 9 PM Monday night, though the 6500 block of Sabado Tarde remained closed several hours later for investigation.